COMPATIBILTY Fits iPhone 8 Plus and iPhone 7 Plus. Specifically designed for your Apple i Phone 8 Plus & i Phone 7 Plus for easy access to all buttons, camera, speakers, charger port and connectors. Supports Apple Pay and engineered to reduce the chance of signal loss and to allow full connectivity of WiFi, Bluetooth and NFC functions. CONVENIENT Phone case and Wallet in one! Folio style wallet case allows you to take your phone and your daily essentials with you without carrying your wallet. 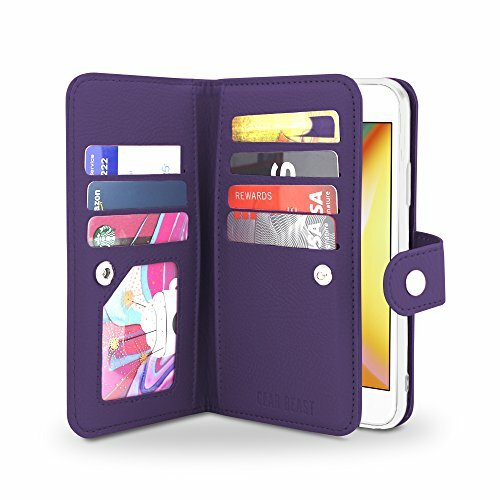 Case features SEVEN CARD SLOTS for debit and credit cards including a TRANSPARENT I.D. SLOT for easy access to your Photo Identification. TWO LARGE INNER POCKETS for carrying cash, coupons, lottery tickets and other items. SECURE SNAP FASTENER allows you to quickly and easily secure and access your case. Removable WRIST STRAP. If you have any questions about this product by Gear Beast, contact us by completing and submitting the form below. If you are looking for a specif part number, please include it with your message.